Do you want to make your brand logo part of their daily habit? It can be easily done through these 1.75 Inch custom printed round acrylic keytags. These round and clear acrylic keytags will make your brand logo easily familiar and popular with your recipients. 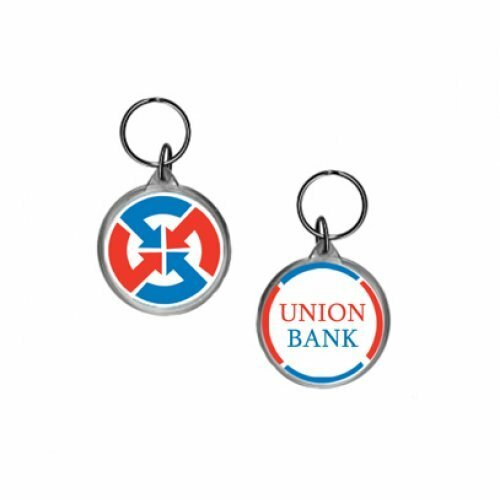 This key tag offers a split key ring and large imprint area for your brand logo. You can order these acrylic keytags in bulk before your next event. Avail attractive discounts on wholesale orders of these customized round acrylic keytags. Request a quote to know savings that you can pocket on bulk ordering these 1.75 Inch customized round acrylic keytags. Product & Design Quality -Product was what I ordered and quality as expected. Customer Service & Shipping - My order proof approval was submitted in time but delayed by your system as explained by your customer service agent. As a result, expedited shipping was required once the problem was noticed. Your "policy" required that I pay the shipping for your systems error. Had my timeline not already been compromised, I would have moved the order to another vendor because of this lack of service on your side to correct the issue. Product & Design Quality -The quality is excellent! The way this company turns your artwork around and provides a proof quickly is why we keep coming back for more! Customer Service & Shipping - The customer service staff is top notch! Super fast shipping is great too! Product & Design Quality -Easy to submit the design, confirmation received timely. Customer Service & Shipping - Needed the key chains for a ribbon-cutting ceremony. Order tracking was good - key chains arrived on time. Product & Design Quality -The product and design quality is excellent! Customer Service & Shipping - Your customer service team is top notch! The shipping is expedited - we received our order in time for our function. 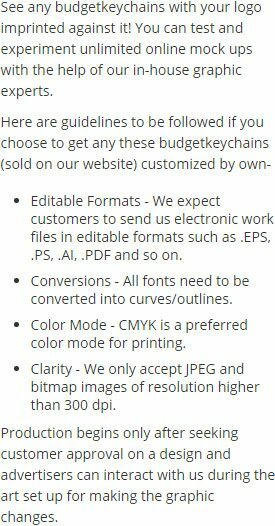 Will reorder again and again from Budget Keychains should the need arise and will spread the word of how great your company is to work with! Product & Design Quality -Very very good!